A sequence is an ordered list of things. It may or may not have a rule, or even a pattern. It can be a sequence nonetheless. We live in a world governed by four dimensions … three of them are lengths/distances and one is time. We can therefore set things out in order along a line, a length dimension. For example, we could set up our groceries in line along a table. This is a sequence. Other sequences based on things being placed in order along a line would be the planets in the solar system (according to their distance from the sun), the DNA code (see the mock sequence at left) constructed from the order of four bases Adenine, Thymine, Cytosine and Guanine along a chromosome, the order of colours in a rainbow, or simply a list of names on a page. We can also order things according to time. For example, you might record what you ate for breakfast every day for a month. We can even order things in a more abstract way, according to number or some measurement that can be ordered. For example, we could associate the letter a with number 1, b with number 2, and so on. Or, we could order the planets of our solar system based on their masses. These, too, are sequences. 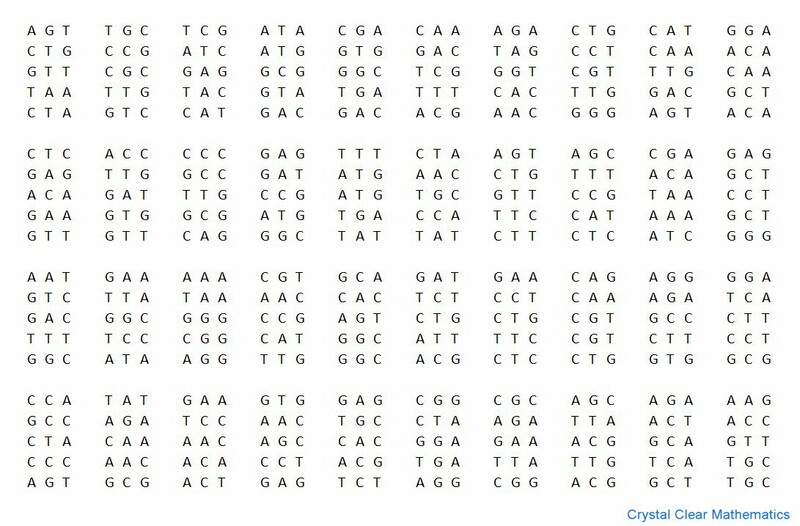 We are naturally curious about, and fascinated by, sequences. I have watched YouTube videos in which someone has photographed themselves every day for years (here is one where Dutch artist Frans Hofmeester filmed his daughter for 15 seconds every week for 14 years from the day she was born). You may have also watched a video of someone dancing their way around the world. Where the Hell is Matt? went viral on YouTube in 2008 and, in 2015, has almost 50 million views! It is partly a time sequence and partly a space/location sequence. Even as young children we are curious and startled when a sequence is broken, or when continuing it would lead to strange or humorous consequences. E.g. the Knock-Knock joke called Interrupting Cow: Knock, Knock. Who’s there? Interrupting cow. Interrupting c— MOOOOOOOO!!! Researchers tell us that even infants weeks old anticipate consequences! Cause and effect is a sequence. Sequences form a natural part of living. Even numerical sequences hold their fascination. In all fields of study and research, and in the different sciences, sequences are discovered. The number of electrons in the energy shells of an atom … 2, 8, 18, 32, 50, 72, the (theoretical) population of rabbits 1, 1, 2, 3, 5, 8, 13, 21 … and so on. I have in my possession a book called The Encyclopedia of Integer Sequences by N J A Sloane and Simon Plouffe (Academic Press, San Diego, 1995). 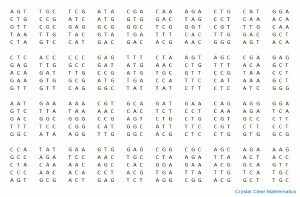 It contains over 5,000 integer sequences, arranged for easy reference, and cites the reseach paper or literature that they came from (you can read more about the publication here). Why is it so useful? You might have been researching something fascinating and wondering if your sequence was relevant to any other field of endeavour. This book provided a resource where you could check to see if someone else had been investigating your sequence. For example, in the combinatorics section of my website, and on YouTube, I posted a video analysing how many different ways the cards could fall in that famous card game, 52 Pickup. The sequence that I obtained (1, 1, 2, 14, 252, 10332, 878220, 142271640, 40831960680 …) does not appear in the dictionary, but the sequence of regions between the cards (1, 2, 7, 18, 41, 85 …) does! By the way, you can read my analysis of the game here. If you want to spend an interesting time, the Encyclopedia of Integer Sequences is now Online. Try typing in any sequence you can think of, such as Fibonacci’s Sequence (1, 1, 2, 3, 5, 8, 13, …) and see what the dictionary uncovers! Sequences can be finite or infinite, numerical or not. The good news is that you don’t have to start in a complicated way. Most students in high school only study two kinds of very predictable number sequences. One of them involves starting with a number and repeatedly adding a constant for ever (the constant may be positive or negative or even zero). The other kind involves starting with a number and repeatedly multiplying by a constant for ever (the constant may be a fraction). We will begin by having fun with sequences and then investigate these two special kinds. In time, I may get to share about more sophisticated sequences and talk about convergence and other matters. A Strange Anecdote in Which a Mathematician Used a Sequence to Predict His Death! The amazing French mathematician, Abraham De Moivre (1667-1754) is probably best known for de Moivre's Formula, (cosx + isinx)ⁿ = cos(nx) + isin(nx), which revolutionised mathematics by connecting complex numbers and trigonometry (and pre-dated Euler's formula). Apparently, in his later years, he became increasingly lethargic and required longer sleeping hours. 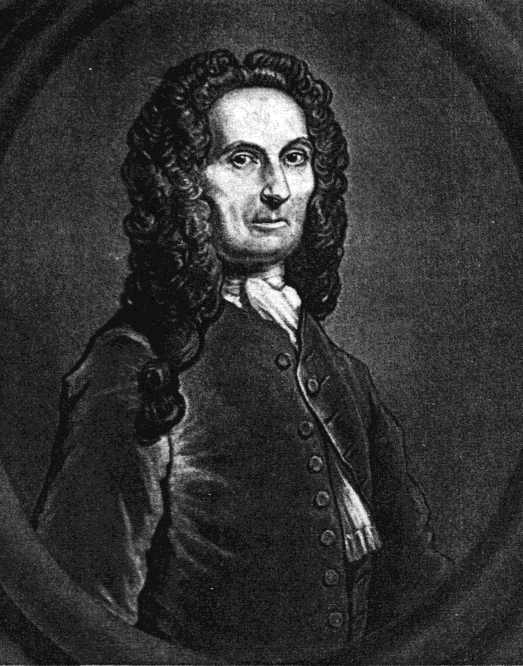 He noted that he was sleeping an extra 15 minutes each night and correctly calculated the date of his death as the day when his sleep requirements would reach 24 hours ... on 27 November, 1754. Once again, this is ridiculous. You get no views yet provide some of the most beneficial mathematical videos on the whole of youtube. Please man, keep up the good work. If it means anything, you are really helping me out as I am not the best maths student but have a genuine interest to get better, I only realized it a year ago.